Apple officially launched today, October 17, 2014 (Philippine Time) the iPad Air 2 and iPad mini 3 in an exclusive event in Cupertino, California. 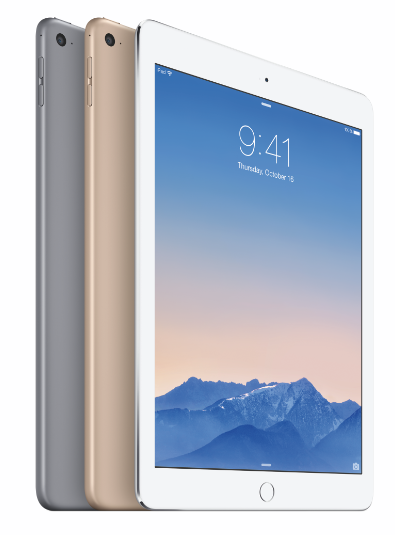 iPad Air 2, dubbed as the thinnest and most powerful iPad ever is now just 6.1 mm thin and weighing less than a pound. iPad Air 2 boasts an improved Retina display and better cameras for taking stunning photos and videos. The new iPad Air 2 and iPad mini 3 offer Touch ID so users can unlock their iPad with just the touch of a finger and make purchases easily and securely within apps using Apple Pay. “iPad Air 2 has a new Retina display with anti-reflective coating, second generation 64-bit A8X chip, all-new iSight and FaceTime HD cameras, faster Wi-Fi and LTE wireless, and includes the revolutionary Touch ID fingerprint identity sensor,” Philip Schiller, Apple’s senior vice president of Worldwide Marketing said. The new iPad Air is powered by Apple-designed A8X chip, which delivers a 40 percent improvement in CPU performance and 2.5 times the graphics performance of iPad Air, and still delivers the up to 10-hour battery life users expect while working, playing games or surfing the web. The new iPads come with iOS 8.1 including Continuity features across iOS 8 and OS X Yosemite that enable all your Apple products to work together seamlessly. The new iPad Air 2 and iPad mini 3 are available in gold, silver and space gray. iPad Air 2 and iPad mini 3 will be available for order online in 29 countries and territories including US, Australia, Canada and China beginning Friday, October 17. Apple has no words yet for the availability in the Philippines. iPad Air 2 with Wi-Fi + Cellular models will be available for a suggested retail price of $629 (US) for the 16GB model, $729 (US) for the 64GB model and $829 (US) for the 128GB model. iPad mini 3 with Wi-Fi + Cellular models will be available for a suggested retail price of $529 (US) for the 16GB model, $629 (US) for the 64GB model and $729 (US) for the 128GB model. TheSummitExpress will update this website for the iPad Air 2 and iPad mini 3 exact Philippine price and release date once officially announced. Like Us on Facebook or Follow Us on Twitter and Instagram to receive more updates.